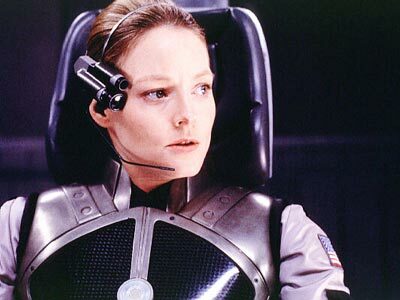 Did you read Carl Sagan's "Contact" or watch the subsequent movie starring Jodie Foster? Both are awesome although I admit Matthew McConaughey as the priest was a stretch. He tried. Remember when they're building the machine the aliens beamed instructions for and they decide to put a chair in it? The aliens had just sent detailed plans to build the most complex machine ever created on Earth, but humans had to inject a chair into it, not trusting that a supreme intelligence would have accounted for a person's need to sit during a trip across a few galaxies. And Jodie sits in the chair and when the machine starts up, the chair starts shaking violently because the aliens didn't instruct the humans to put a chair in it and that's because they weren't supposed to put a chair in it? So she unhooks herself and the chair breaks loose and sticks to the side of the orb? And she floats to Never-Never Land? Hmmm. I liked that movie. I am reading this book, Born to Run, because I fancy myself a runner in my imagination, and also because it's extremely well-written and entertaining. And I had been training for a 5K and then something happened to my leg and there was this awful pain that didn't go away for a while. And I thought, well, it's because I'm overweight. And I googled the problem, and all the runners sites say my left foot is pronating too much. Which is a bummer. And then I'm reading this book, and at one point it says that the more expensive your running shoes are, the more likely you are to suffer an injury. It's involved, the discussion of why highly advanced shoes made to cushion and support your foot will actually hurt you. Suffice to say shoes change how you run, and the impact on your body is greater when you're wearing Nikes than when you're running barefoot. Before modern, supportive shoes, foot injuries were almost nonexistent. Shoes make the muscles in your feet weak. We cushion each muscle in the foot, pushing up on our arches, when in reality you would never push up on an arch. The whole structure would crumble. We have these miraculous bodies with innumerable nerve endings and intricate musculature and sleek bones that move and pivot with grace, and instead of trusting that however this happened, our bodies are machines capable of running, jumping, swimming, dancing, crouching, stretching... Instead of trusting this, we build a chair for that machine. I'm not saying I'm joining the barefoot movement. But I'm definitely rethinking my expensive running shoes. Oooohhh! Good post. Here is a link to the "non-shoes" I was telling you about. http://www.vibramfivefingers.com/ No way I'm trying this, but maybe you should? A dude here at work had those goofy shoes. They looked pretty weird. I think he got those after reading the same book. Oooooh! Drinking the barefoot kool-aid! Couldn't agree more. Not that I run or anything... but just with the themes of this post. It made me think too of no-shoes shoes.... I dare you!